In searching for a source for a reader, I stumbled across this lovely article about Sarah Howard Stone. I loved this "definition" the editor gives for French Hand Sewing. Doesn't that sound just dreamy? It did to me. I have used SHS's patterns in the past and love both of her books. Thank you Prime Montgomery for this wonderful article about a well loved artisan. I followed the link and read the interesting article about "Miss Sarah". I had no idea she was even alive! I have both of her books use them for inspiration. While I love to hand sew, it is just so very time consuming! But I have to admit, the process is so soothing and it is wonderful to create such lovely items. 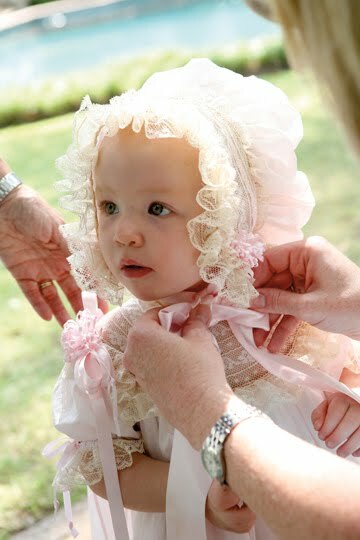 I am now eagerly hoping for a great-niece....that is, if babies can wear those outfits in Concord, NH....it's not very warm there! Love the article! I do love the basket of lace sitting by her as well. I was thrilled to see the article for Sharon. I've been trying to find out more about her. Tyler was the first heirloom pattern I bought. 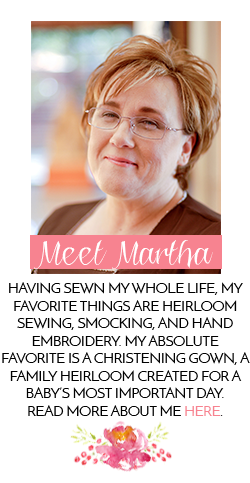 Thanks for posting this link, Martha. It is nice to see Sarah get some of the attention she so richly deserves. I am a French follower of your blog and I am truly impressed by all your sewing and embroidery. Here in France, French embroidery does not exist anymore ... I truly cherish family passdowns, and hope one day I'll be able to duplicate them !! I followed google to your blog after looking for Sarah Howard Stone. I visited in her Old Cloverdale shop many times. She was almost always there, and I was always stunned that so great a woman was willing to chat with me about my completely amateur sewing projects. Oh to be like her! She gave me tips on the simple things - like how to store vintage linens. I no longer have connections in Montgomery so don't frequent her store anymore. I wonder if it is still open. Does the book include instructions on smocking and does she include easy to follow diagrams? Is this book suitable for a beginner to hand sewing?